Then we went down 250 kms. 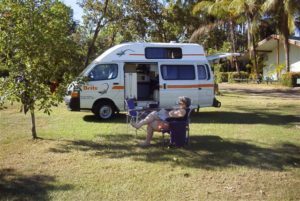 to Kakadu National Park for four days … a Park of rivers, floodplains, cliffs and Aboriginal rock art etc. over hundreds of square kms. Then we went on a small bus tour to Ayres Rock (Uluru) for several days …. a distance of 463 kms. On the way down from Darwin to Kakadu National Park, we saw on the map this place called Gunlom …… it was so wonderfully described on the map. We turned off the main highway and began travelling over 40 kms to Gunlom on an unsealed loose gravel road …. all at a bone-shaking 20 – 30 kms. / hr. for 1.45 hours. We just followed the map of the area with a description of a waterfall with a plunge pool at the end of the road. We passed through dry eucalyptus woodland for kilometre after kilometre ….. Many times we wondered if it was worth it. Right at the very end we suddenly came into this green valley with high cliffs and a waterfall plunging off the escarpment. It was a small green – grassed oasis with big sprinklers going on mown lawn under shady eucalypt trees which the Park Ranger kept in order. We made camp in the camping area with our camper van. There were even hot showers run from solar heating. Our camper van in another locality ….. totally self contained with a gas stove and with 12 volt for lighting and a small refrigerator. 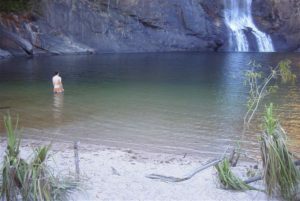 We walked into the falls for a swim (no crocodiles at last!) …. It was very cold water but very refreshing! I took the above photos and did the environmental journalling given here in the morning before we left the area. It was just pure natural beauty and not man made cultivated beauty as we found in Europe (England and Italy) as in previous trips overseas. 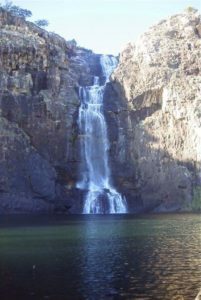 Gunlom, means ‘waterfall creek’ in the Jawoyn Aboriginal language. Falls Overall: The water falls in a series of broken cascades from 100 metre high falls in a five metre wide curtain of water …… the water falls off the sheer sandstone escarpment above the level where I am …… The cliffs of the escarpment encircle the space of the falls in sheer falling cliffs to 400 metres around. See the diagram: Gunlom Plunge Pool of this wonderful pool. The pool is smooth green in a circle of glass clear water ….. about 150 metres x 150 metres of pool ….. the back of the pool is edged by the black / brown sandstone cliffs …… the water falls vertically into the pool at the base of the cliffs …… pool is dark liquid green at the back of the pool and slides up out of the depths to shallow light green liquid water in the shallows of the gravel beach …. see the photos above. Vegetation on the left hand of the pool consists of small trees up to ten metres high of a dry rainforest consistency with close dark green leaves ….. trees angle up the cliffs in a series of three rock terraces and grade into the surrounding woodland forest. On the right hand of the pool, the dry woodland forest comes down to the waters edge. It then changes into a paperbark forest (Melaleuca Forest) ….. the trees grow to 30 metres high with single trees then spreading out into the gravel beach …… the gravel has been piled up against the trunks from the wet season flooding. The water around the plunge pool on this side is edged with river pandanus …. the spiky sedgelike tops grow to three metres in height ….. the river pandanus forms a continuous five metre wide banding around the entire pool edge on the right hand side of the water. See the photo above of the little creek outlet. 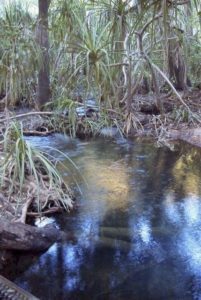 This species type is commonly seen growing on beach fronts and headlands in an Eastern Coastal setting, but here in Kakadu National Park, there is a particular species of river pandanus which grows right in fresh water. Sandstone Gravel Beach is a coarse sandstone gravel beach to 150 metres in length by 50 metres in breadth which rises by two metres above the pool level …. the beach is a mixture of sand, fine gravel and coarse gravel eroded from the sandstone cliffs ….. Gravel is 10 – 20 mm in size. In the Dry Season, the water is at the pool level shown the above photo whereas in the Wet Season … (The Monsoonal season), water falls off the escarpment in a great flood and water floods over the gravel beach as a great torrent of water. It then piles up the gravel against the trunks of the scattered paperbark trees.